I’ve been waiting all summer for this root beer float! I don’t know what it is about s’mores. I’m sure it’s the flavor. Definitely the texture. Probably the mix of chocolate-y goodness and melt marshmallow? The s’mores combo just makes EVERYTHING better and it’s certainly the case with this root beer float. The fact that this is not the first root beer float I’ve shared on my blog is slightly alarming. It’s not like you need an actual RECIPE, after all. Remember when I was super into all things root beer float? I made these root beer float cupcakes and it’s been years since I’ve had them again, so perhaps this weekend will be it. Those things are insane! I’ve made root beer floatsicles and early this year I made the root beer rum creams. There is something about root beer floats that just taste like the greatest parts of childhood. And I can’t even tell you the last time I drank an actual root beer. And you’re not seeing things! Last year around Saint Patrick’s Day, I made s’mores stout milkshakes with beer and they are deeeelicious. Like super sinful and wonderful and such a treat. So here we go again. These floats are my ode to summer. I’m torn! Because with a month of summer left, there are still a handful of warm weather cocktails I want to make. But it’s also honeycrisp season, and since that lasts for only a few weeks, I can’t miss out! I think that this s’mores root beer float is sort of my farewell to summer cocktails and mocktails. After all, I have shared nearly 20 (!) of them in the last few weeks. Definite options. Here? We have a root beer float with vanilla and CHOCOLATE ice cream, which is super special if you ask me. I mean, okay, maybe it’s not special per se, but for some reason it makes the entire thing SEEM special? It’s like a black and white root beer float instead of a black and white shake. You can also take this over the top and add some marshmallow cream if you wish. Sometimes I’m into that, other times it’s super duper sweet. ALL the time I want a s’more though. 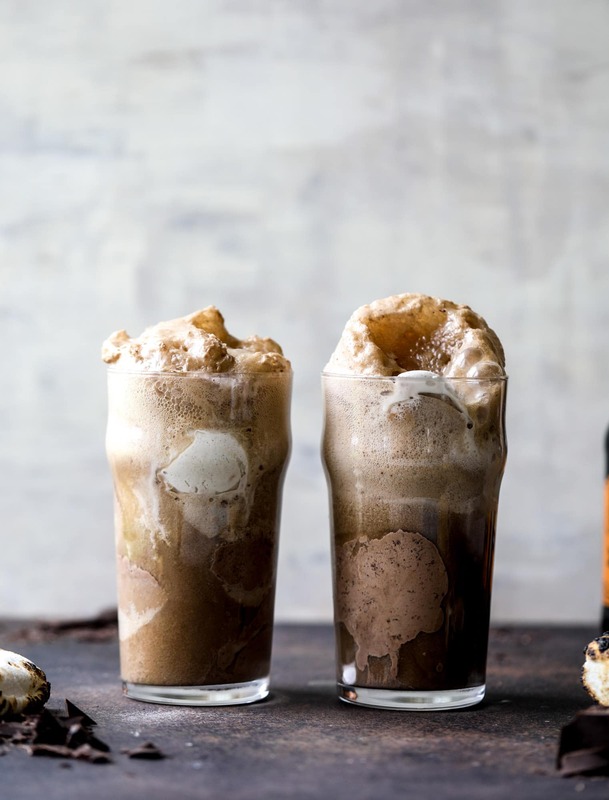 A fun twist on a classic root beer float, using the flavors of S'mores and both vanilla and chocolate ice cream. Plus the mix of chocolate-y goodness and melted marshmallows from the S'mores! To melt the chocolate chips, place them in a bowl and microwave in 30 second increments until melty. I like to take a spoon and drizzle this around the rim. Fill each glass with both chocolate and vanilla ice creams. Add a pinch of smoked sea salt into the glass. Pour the root beer over top just before serving. Sprinkle on the graham crackers and add a charred marshmallow on to finish. Devour! As a note, you can char the marshmallows on a gas range, under the broiler (watch them the entire time!) or even just get them melty in the microwave if you don't have a bonfire of sorts. Can you make an edible graham cracker glass? That looks like you could drink and eat the whole thing! OMG now THAT is a great idea. This looks so amazing! I may have to make it tonight! This is looking so yummy I will definitely try this. Gah!!! Now this is a blast from the past. . . with a twist. Growing up my mom used to treat us every now and then with a root beer float. They were the best! Crazy enough. . .I haven’t had one in the longest time. What the heck is wrong with me?! I mean I’m an adult now and can have them morning, noon, and night if I want. 😂 Loving your twist of mashing it up with another childhood favorite. Genius! I can’t wait to try this!! Love the “campfire” flavors, such a great transition to fall! 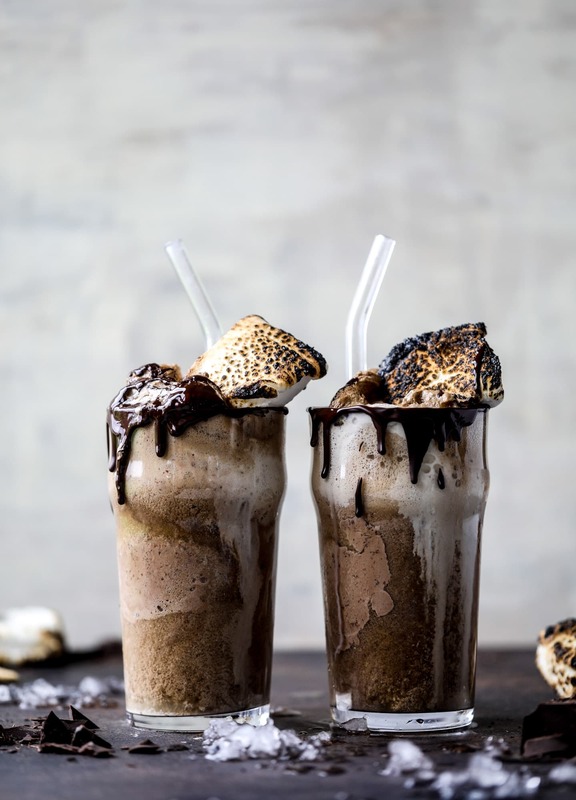 Thanks for sharing the receipe of SMOKY S’MORES ROOT BEER FLOATS. Looks delicious and has an abundance of memories brought to mind from my childhood. Delicious food plus delicious float, it’s perfect. This treat will guarantee enjoy my friends this upcoming summer. Hope next time you can show us a video. Thank you for this goody recipe.